Here’s the Final Prayer of The Christmas Novena! My lord my almighty father.. Thank you with all my heart and soul for watching over me and family and keeping us all safe and in good health in the year of 2017..I pray to you my lord my almighty father that you will do the same on the new year of 2018..Amen. Thank you so much for sending us novenas,we are really blessed,the year ended very well. I had a bad start my son was involved in a car accident, by the Grace of God he was not badly injured, he is still hospital.I do hope the Lord will give him strength to pull through this since he is expected to do his practical at work before the third year starts.Please pray for my son. Lord Jesus and our Blessed Mother Mary, thank you for taking care of us and our families throughout last Year and bringing us into 2018, we continue to pray that our Blessings will be more than we ever imagined this Year. May our Lord pour numerous blessings on us and our families so that Testimonies will fill our mouths. I thank God especially for the gift of Annie & John Paul for forming this wonderful Pray more novena group, may God continue to inspire them, give them the strength and continued grace in everything they do and grant the desires of their hearts. Also praying that all who join this prayer and our families receive more blessings, answers to not only what we pray for but also more than we pray for. Thank you for this beautiful apostolate. I cannot fully express how grateful I am for these novenas. May our Lord continue to bless your work. Thank you so much for this e-mail ministry. It has definitely enriched my prayer life/ time. It is easy to click on and there are beautiful prayers for every need and for everyone who you are praying for. My bible study group did the Advent Retreat during Advent for our study. We all loved the talks and speakers. I especially loved at the end how all of you said the rosary with us. Special! You guys look just beautiful. Good bless you both. Keep up the great work. Many blessings and Merry Christmas to you as well. Lots of love and kisses, Alba. A Blessed Merry Christmas To All!! Thank you for all the Novena’s and special prayers from all. May the Lord bless you and keep you safe this coming year 2018. Lord jesus i pray a blessings on MY WORK PLACE . i PRAY THAT EVERYONE WITH EVIL INTENSIONS BE REMOVED. I pray that all dishonest persons be remove in JESUS NAME . i PRAY THAT be remove. In jesus precious name amen. I am very grateful to Jesus two of my intentions have been granted. One was my sister in law has been in an emergency heart surgery and she did not came back from the induce coma. As soon my brother informed me I included her in my petitions. Glory to Jesus the third day after I pray the novena she came out of the coma and on Tuesday the doctors send her home. Other of my intentions has been heard also. Thanks John Paul and Annie for including me in the novenas. I pray for you! I also pray that God will help me find a good man to be my bestfriend and husband. Thank you. That God may alwaysbe praise and glorified.. Thank You Infant Jesus for this novena. My prayer was answered incredibly. God bless Praymorenovena.com and all those who prayed this novena with me. Thank You Mother Mary for Your intercession. Amen???????????? merry christmas too L.V. let Jesus be born in to our hearts. cat , Curley passed away 26th.December 2017 in Melbourne , Australia . Local Time : 7.07 p.m. I wish John Paul and Annie a Very Merry Christmas. Looking forward to the next Novena! HAPPY BIRTHDAY LORD JESUS ! We need you Lord Jesus, More than ever. Merry Christmas John-Paul and Annie! God bless you! Thank you God for the gift of your son, our Lord Jesus Christ! Happy Birthday Jesus! I thank the Lord for good health in the family for the Christmas season. I pray that we continue with this health through out 2018. Merry Christmas to you both! May God bless you. Thank you for all you do! Please bless John-Paul & Annie abundantly for creating this community of prayer. And blessings on all those who join in prayer. Thank you for some relief from depression and anxiety, for a good night and upcoming day with my son, for blessings which I do not always appreciate. Thank you for the gift of yourself to us. Thank you for allowing me to surrender all to you Lord. I love you Trinity, Amen. Thank You so much for Your love, blessings and protection. Thank You dear God for all You have done for us and continue to do. Please lead us and guide us in the right direction, so we may please You and turn away for sin. Please forgive us for all our past sins, and please help us to be stronger and to make the right decisions for our future. Thank You so much dear God. I love you. God bless Annie and John-Paul for this beautiful and grace-filled site of PRAY MORE NOVENAS! You will be greatly rewarded! I pray for your special intentions also! May Jesus bless you both abundantly on His birthday. 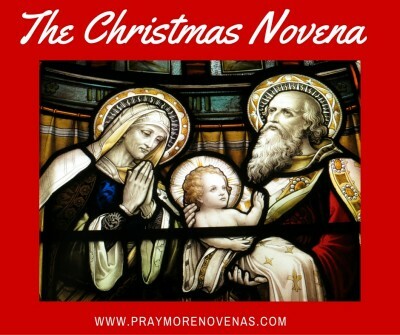 Merry CHRISTmas to all of those praying these novenas. Merry Christmas! Lord Jesus, Thank-you for this blessed day… For unto us You were born! ✝️ Thank-you for all I have been given this year, Lord as you walk beside me each and everyday! I am so grateful for the time I had with my sons who came and stayed with me, it made my heart so happy! I know that because of You, and praying these Novenas it happened with Your Grace! Lord keep them safe as they travel throughout their days, help them to love You more, seek You more, know You more! ???? Lastly, I pray with a sincere heart, knowing You hear my prayers, Lord that my blood work comes back good for my health! Hear my prayers, I want to be healthy, no health issues…to keep working, the abundance of work and income to support my family! I’m so blessed and grateful for I have! Happy Birthday, Lord! Peace to all in our world ??? ?